Although these days SCSI hard drives are quite rare, they are still in circulation and we occasionally see them when faults develop. Generally, there are 3 common problems we see on SCSI hard drives. Symptom: Common particularly on Seagate SCSI hard drives, the hard disk spins as normal and is still recognised by the computer. It’s capacity is reported as 0 bytes and it is unresponsive – the drive’s contents can not be accessed. Cause: This is as a result of a corruption to the hard drive’s firmware (the program the controls that hard drive) and it’s necessary to repair the part of the firmware known as the translator in order to gain access to the data once again. Recovery: Repairing translator tables is extremely complex and Data Clinic are able to recovery 100% of the data from SCSI drives with this fault. Symptom: Again, common on Seagate SCSI hard drives in particular, the hard drive will power up normally but without any capacity and produce the message ‘Medium Error’. Windows will see the drive but again with no size or access to the data. This is an error produced when the SCSI hard drive starts up and is usually indicative of an electronic or mechanical failure on the SCSI drive. 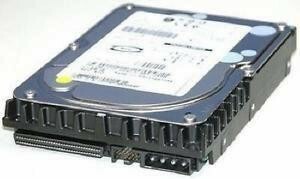 Electronic problems can often be rectified and the data recovered but mechanical problems, especially on SCSI hard drives present a much more challenging problem as frequently the drive will have suffered a head crash and the data on it will not be recoverable. For more information go here https://www.dataclinic.co.uk/scsi-failure-start-unit-request-failed/. Access to the files and folders on SCSI hard drives can be lost for many reasons in addition to the ones listed above. For a general appreciation of these go to our page that explains how hard drives fail. We are able to recover data from most hard drives from most data loss situations, see Data Clinic’s UK locations or call us and arrange for a free collection of your SCSI hard drive.